Set on 300 acres, and surrounded by golf courses and mountains, The JW Marriott Phoenix Desert Ridge Resort & Spa offers indulgent luxury in the heart of the Sonoran Desert. 950 plush guest rooms and suites surround you in comfort and tranquility, with thoughtful amenities and panoramic views. The resort features five uniquely themed pools, including a kid-friendly lazy river and waterslide. Test your long game at either of the two championship golf courses, designed by the legendary Arnold Palmer. Then relax at Revive Spa, which offers a full-service spa treatment along with a fitness center. Enjoy delectable Asian-fusion cuisine at Roy's Pacific Rim, or at MERITAGE, the renowned steakhouse. This stunning resort truly offers everything you can imagine and more! 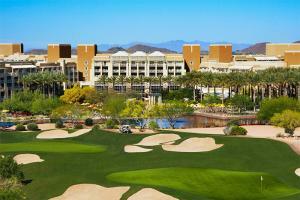 Located less than 20 miles from downtown Scottsdale, and 25 miles from Arizona State University. Wildfire Golf Club, Camelback Golf Club, Old Town Scottsdale, Phoenix Art Museum, Chase Field, Westworld.